It’s all about the view in Calheta. Ponta do Pargo Lighthouse, the world’s tallest lighthouse, is perched on the westernmost tip of Madeira. A glass skywalk hangs over the cliff of Cabo Girão, one of the highest vertical drops in Europe. Casa das Mudas, a contemporary art center whose building is made of interlocking cubes, was carved into a cliffside plateau. Calheta Beach, with golden sand imported from Western Sahara, is the spot to watch adventurous surfers and paragliders. But the best view of all might be from a rooftop pool. Savoy Saccharum’s rooftop pool is stunning. Its tiered terraces sit on the eighth floor of the sleek hotel. Its surrounding tiles are iridescent; they seem to change color based on how the sun hits them. Black sun loungers sit under gray umbrellas and atop slate that hovers above the water. The pool has an infinity edge; its water looks like it’s tumbling down the cliff. While the view extends over to the nearby mountains, down to the beach and the marina, and out to the Atlantic Ocean. The rest of the hotel is impressive, as well. Savoy Saccharum, in little Estreito da Calheta, opened on the site of an old sugar cane mill three years ago. Though the hotel is decorated with a lot of modern brick and leather, photographs of sugar cane tie it to the island’s history. With almost 250 rooms, the building is larger than the boutique hotels at which you usually stay. The rooms’ glass-and-marble bathrooms, walk-in closets, and sea views beyond their sheer curtains quickly make you forget about its size, though. You won’t notice the size at the Saccharum Spa—where you’ll find a halotherapy room, an ice fountain, a sensorial shower, and a Turkish bath—either. 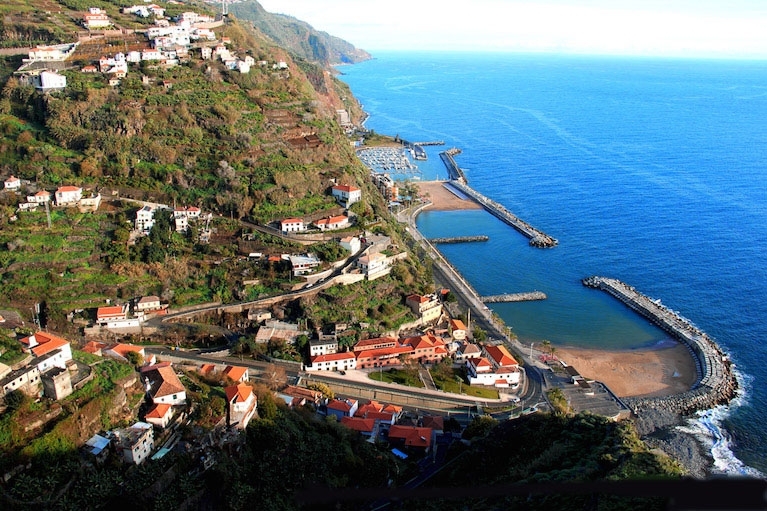 Calheta, along the south coast, is one of the oldest parishes on Madeira. Its rich, volcanic soil has grown sugar cane since the island was discovered in the 15th century. Portuguese noblemen and knights quickly followed. The picturesque village is home to historic churches, a sugar cane museum that’s still a working processing factory, and a rum distillery. It’s also one of the sunniest spots on an island already known for its perfect weather. The island, Madeira, is an autonomous region of Portugal. Its three islands—Madeira is the largest—lie southwest of the mainland in the Atlantic Ocean. With the Canary Islands 250 miles to the north and Africa 280 miles to the east, this is the outermost region of the European Union. The uninhabited islands were first claimed by Portuguese sailors in 1419 during the Portuguese Age of Discovery. Settlement began soon after. By the end of the 15th century, the islands, named for the abundance of fennel found on them, had become an important shipping center. Today the volcanic islands are a popular year-round vacation destination. Until recently, most of its tourists were older Brits. But a handful of new boutique hotels, including Savoy Saccharum, is starting to change that. Stylish rooms, open restaurants, cutting-edge spas, and dramatic pools are now luring a new generation to the Garden Island. 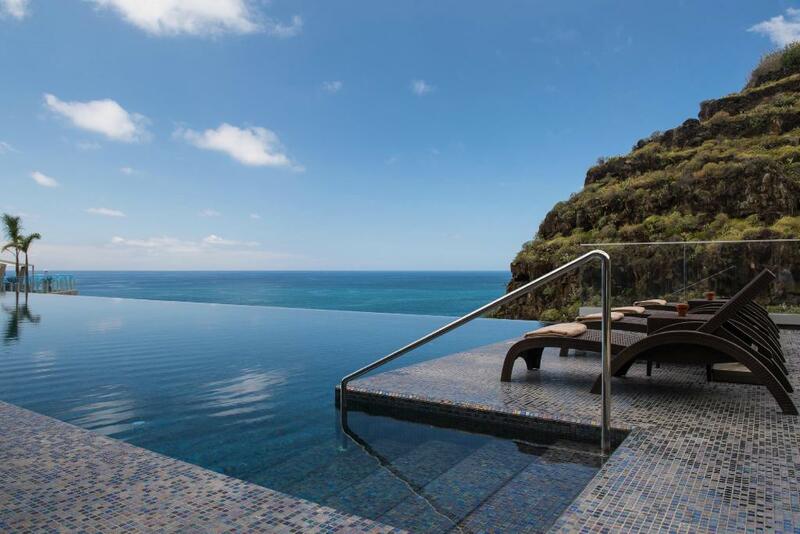 You just have to decide how long you’re willing to tear yourself away from the infinity pool to see Calheta from different vantage points. Don’t worry, every view is stunning.